We recently had the opportunity to test drive one of Road Tools products, the Podium CoolPad. Like its sibling the CoolPad, it uses natural air convection to dissipate your computer's heat and has a 360 degree swivel, however the Podium CoolPad has the additional feature of letting you adjust the computer's incline. So why would you want to incline your laptop? Ergonomics, baby! Here's the thing... while working on a computer your eyes should be in line with a point on the screen about 2" below the top of the screen, and you should keep your wrists as flat as possible. Doing both at the same time is pretty much impossible with a laptop, unless you are a very weirdly proportioned geek. The podium has stackable risers that let you adjust the keyboard incline by 1/2" increments, you can raise or lower the angle quite easily by just snapping them together. By experimenting a bit, you can find a comfort zone that will make it easier on you to do your work. And there's nothing to attach or fuss with, you simply plop any laptop on top of the CoolPad. That's it! Snaggy: I recently moved to a laptop as my main working machine, and immediately had a lot of neck and shoulder troubles. Raising the machine's screen to a better eye level has really helped. (I also now use a separate keyboard, and that's helped too.). Nitrozac: Adjusting the height with the stackable risers is fast, fun, and easy. The risers are similar to lego blocks, and thats cool, especially for geeks. I raised my iBook with two stacked risers, and I noticed an ergonomic improvement immediately. It just felt better, more relaxed to use. The Podium now includes extra center supports, which are great if you own one of the new wider and thinner G4 PowerBooks. If your laptop has a contoured bottom (iBook) you can remove these center supports and it will work just fine using the two outer supports. 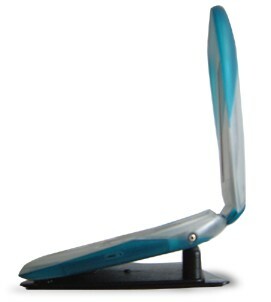 Nitrozac: I have only one complaint, the Podium CoolPad swivel-action was a tad clumsy with my iBook because of the iBook's shape, although it worked perfectly with our Pismo. Snaggy: Yep, using it with the iBook was not 100 percent perfect, the little feet on the iBook don't quite line up with the Podium's front supports, but this is really a nit-pick, for all intensive purposes it is still a great product for an iBook. Being able to rotate your laptop is great, especially during meetings, demonstrations, (and brainstorming about cartoon plots while at Tim Hortons). There's also a very high Star Trek factor, ... it allows you to easily swivel your laptop to show a fellow crew member, much like they do on the Enterprise. How does the swivel work? Road Tools website explains that the Podium uses "a patent pending 'friction differential' with a Teflon bearing, 2 thin plates of injected black ABS, and low durometer rubber providing a sturdy platform that allows a laptop's rotation". This swivel action is silent and smooth, and the torque is good. It is easy to rotate, but it's not going to spin when you don't want it to, or if the airplane you're on starts a tight turn. Snaggy: Heh, I used to hope that Apple would come out with a laptop that had a swiveling screen. This is almost as cool. It would definitely come in handy at a meeting, presentation, or a job interview, and would make a great conversation starter as you're booting up. It also comes in handy when I want to remove a CD. Most laptops dissipate heat through the bottom. and the more air that's allowed to flow under the bottom, the better that heat will dissipate. 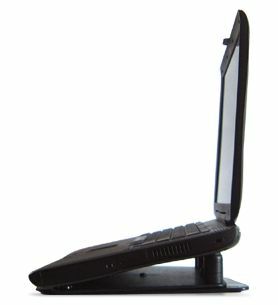 If you place a running laptop on a bed or your lap, where the air is blocked, it may overheat. The Podiums solution is a good example of KISS (keep it simple, stupid).... raise the laptop at the backend, and let the natural airflow cool it off. We monitored the temperature of a Pismo PowerBook CPU using a little ap called Thermograph, but surprisingly, we found little difference in operating temperatures with and without the Coolpad. We suspect this may be the result of us working in an old Canadian farmhouse at the end of winter... the ambient temperate is just too cool for the CoolPad to make much of a difference. We'd be interested in hearing from other geeks how the CoolPad performed for them in this regard. (Post to the forum). The biggest "cool" effect and reason alone to get one is how cool the CoolPad keeps you while working with a laptop on your lap. Nitrozac: While youre relaxing on the couch surfing, it makes a nice little platform to work on, and you wont even notice your laptop's heat. 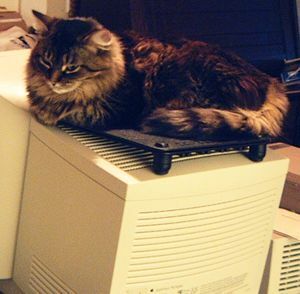 Snaggy: Yep, there's nothing worse than a hot laptop on your lap on a hot day. The CoolPad solves this problem nicely. Podium CoolPad from Road Tools. 30 day money back guarantee and Lifetime warrantee! The little rubber feet on the bottom of the unit really grip, (great for use on an airplane's tray table ) and they won't scuff your furniture like a laptop alone sometimes can. The Podium CoolPad is compact and light, and should be no problem fitting it into your standard laptop carry bag. The Podium Coolpad is available for sale for $29.95 at a number of online retailers, you can check out where at the Road Tools website, or you can pick up a regular Coolpad in real life at Staples. The price, quality, and usefulness are excellent. Road Tools offers a 30 day money-back guarantee, and a lifetime warrantee. And for those of you who demand even smaller accessories, there's the Podium's little brother the Coolpad, which has the same cool features, without the risers, for only $19.95. (Although the Coolpad is not recommended for TiBooks). And there's also the iCoolPad which is available in translucent tangerine or blueberry, although we had a hard time finding any more information on this model. Nitrozac: If youre looking for a gift for a geek, this would be a big hit. Laptop manufacturers should ship them with their products! 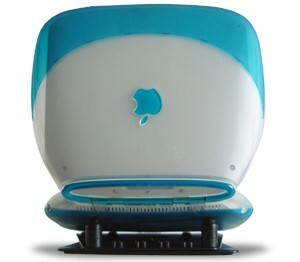 Snaggy: This is simply a really neat geeky gadget. It works great and just makes sense, one of those things you love to use and to play with. Another bonus... RoadTool's personal service... if you ever have a problem just email Jim. Yup, a real guy. Cool!